The following are PNB’s preferred lodging options close to downtown Seattle or Marion Oliver McCaw Hall. You may never twirl your way around the stage but you can certainly enjoy all the pampering afforded a dancing diva. 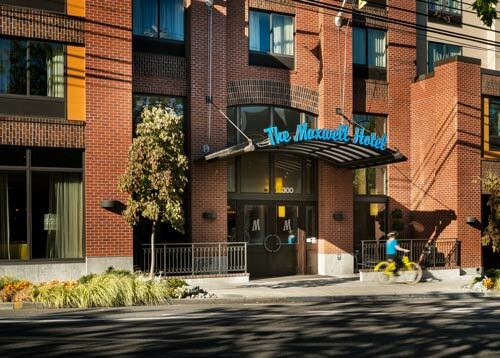 At The Maxwell Hotel there is no shortage of artistic flair: from the lively artwork and tile that adorn the lobby to the names of the rooms themselves (Maestro Suite, anyone?). Even better, we’re just one block away from Seattle’s top performing arts venues—the Pacific Northwest Ballet and Seattle Opera—as well as steps from the Seattle Center and the Space Needle. Guest-friendly perks include, free downtown shuttle service and a 15% discount off our best available rate when you use the promo code ‘15PNB.’ See you soon. The recently-renovated Four Points by Sheraton is close to all the city’s hotspots. You can walk to the Space Needle, Pike Place Market, and great restaurant and shopping districts. We also make it easy to drive around, with garage parking and nearby highways. Our business center has free High Speed Internet Access so you can stay busy, and the workout room is open 24 hours a day. Enjoy a great meal by our cozy fireplace or a tasty drink at the bar. Choose from our 158 guest rooms and suites, featuring a king or double Four Points by Sheraton Four Comfort Beds™. Hampton Inn & Suites is a proud sponsor of the Pacific Northwest Ballet. Within walking distance of the ballet, the Hampton Inn & Suites have 124 beautifully appointed rooms, and 74 extended stay suites with full kitchen and fireplace! Daily continental breakfast is included in the rate. For reservations; please call (206) 282-7700. Mention “PNB” to receive the best room rate. Boutique property with historic charm, romantic ambiance, and a distinctive personality. Conveniently located at the heart of popular Lower Queen Anne just blocks away from Pacific Northwest Ballet and surrounded by a diverse selection of restaurants. Spacious guest rooms feature hardwood floors, period furnishings, and dine-in kitchenettes. MarQueen Hotel offers an abundance of services and amenities, including these complimentary services: Wireless internet, newspaper service (Mon–Sat), and overnight shoe-shine. Book now and Save 15% off the best available rate by calling 888.445.3076 or by visiting MarQueen Hotel’s website, www.marqueen.com, using Promo Code: PNB.